Our tea of the month club is a great way to introduce yourself or someone to the wonderful world of premium loose leaf tea. Each month you will receive two ounces each of 2 teas selected from our best, favorite and most popular teas from around the world. 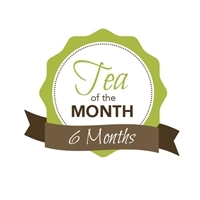 The teas are seasonally selected and will change each month. Your initial order will include your teas with two 4 ounce tins to store your tea in and our perfect tea spoon. Subsequent tea selections will be packaged in our foiled tea pouches. Your initial order is shipped immediately. Subsequent orders are shipped by 2nd week of the month.